The first project for the 6th grade year is this poster project. For Leah's language arts class, or is it called Reading these days? I can't keep up with all the name changes for her courses. 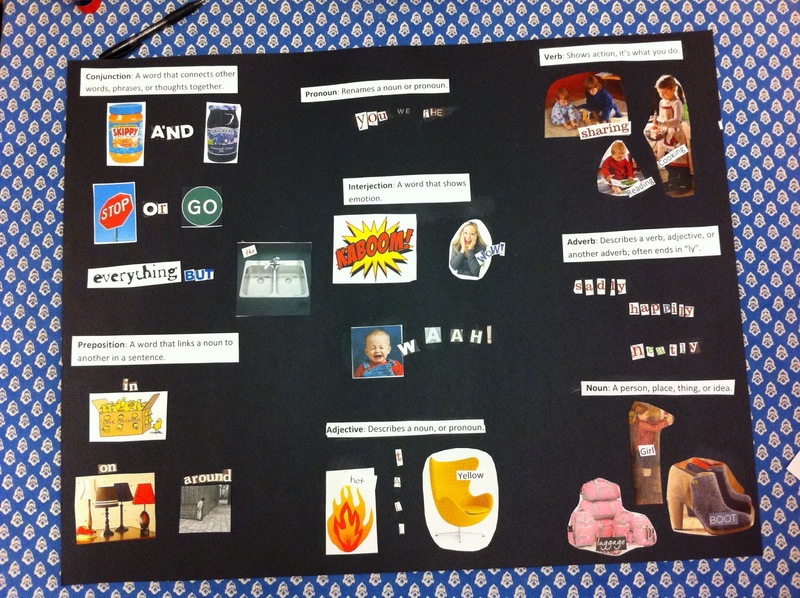 Her teacher assigned a poster project to help the students understand the eight parts of speech. Leah had a week to work on this poster but you know how that goes.....a week turns into 2 days. The instructions are simple leaving room for creativity. Her poster has to be divided into 8 sections for each part of speech to be displayed. For each part of speech 3 examples must be provided. 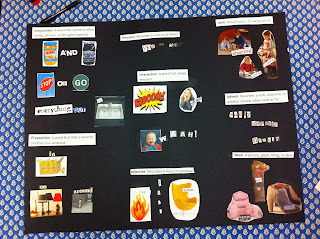 The students may use words or pictures to show examples of the part of speech. Her teacher highly encourages creativity which in my opinion is very good. A label for each part of speech, the definition of the part of speech, three examples in either pictures or words that represent each part of speech (cut from magazines or newspapers), if selections include pictures you must write the word above, below or beside it. NOUN: a person, place, thing, or idea. VERB: shows an action. It's what you do! ADJECTIVE: describes a noun or pronoun. PRONOUN: renames a noun or pronoun. ADVERB: describes a verb, adjective, or another adverb. Often ends in "ly"
PREPOSITION: a word that links a noun to another in a sentence. CONJUNCTION: a word that connects other words, phrases, or thoughts together. INTERJECTION: a word that shows emotion. With that Leah set herself to finding the 8 parts of speech ideas in our mountain of magazines. I had to help her with some ideas but once I gave her an idea or two she really got it and the creativity took over. Have a look and see what she came up with from all those magazine pages. I'm sure her teach had a laugh at some of her ideas. In case you were wondering, yes. Yes she got an A for the project. Another project success!